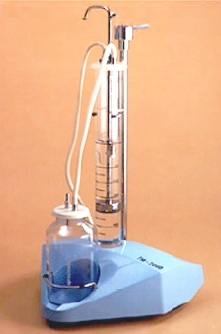 Pleural Water Seal Drainage (WSD) Pump Model FM 2000 has been designed to be able to effect with full guarantee and safety the drainage and the aspiration in the pleural cavity. Identical characteristics that the model FM-2000, but designed to be connected to the network of central emptiness. Specification Sheet: Chassis: Base Polyester reinforced with fiberglass (PRFV) and chrome metal chassis Motor-pump: Of diaphragm without maintenance, Wealth: 150-300 L/H, Maximum emptiness: 30 cmH20 Empty regulator: yes, Flask recollector: 2.5 L, Electrical tension; 220 V/50 Hz, Power: 9 VA, Dimension: 96×41.5×40.5crn, Weigh: 10 Kg.